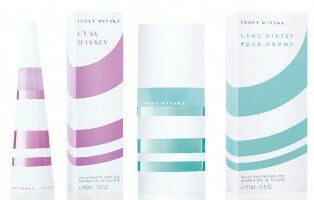 Shown above, the 2010 summer versions of Issey Miyake's L'Eau de Issey (with peony, carnation, pear, woods and carnation; in 100 ml Eau de Toilette) and L'Eau d'Issey Pour Homme (with yuzu, mandarin, cardamom, sage, vetiver and amber; in 125 ml Eau de Toilette). You can see the 2009 edition (and find links to earlier years) here. And from Jean Paul Gaultier, the 2010 summer versions of Classique (rose, orange flower, clementine, lemon, jasmine, ylang-ylang, lily of the valley, iris, vanilla, musk and amber; in 100 ml), Le Mâle (with mint, ginger and ginseng, in 125 ml) and MaDame Eau Fraiche (with orange peel, rose, grenadine, raspberry and grapefruit, in 100 ml). You can find last year's Classique and Le Male summer fragrances (and links to prior editions) here, and last year's MaDame Eau Fraiche here. What’s with all the ribbons of color on the bottles? Is this a new summer trend, or a bizarre coincidence (or shared design team)? How funny! That’s what I thought, lol! Maybe it’s an homage to the bandage dresses that were popular on the runways last fall? Strange. Both lines have the same distributor: Beaute Prestige International (aka Shiseido). Surely the bottle design for the summer flankers is no coinkydink. Thanks, didn’t even remember that. Still, not at all sure this is a coordinated effort. Different from his previous themes. More modern. Would actually like a dress like that.